While the word “library” may bring visions of tall bookcases full of dusty books in a silent building, the libraries of today are a far cry from this intimidating scene. In fact, books are only one of the many resources and media they have to offer. The public library is an excellent resource for your family, with educational programs for all ages, storytimes, family events, and more. Here are steps you can take to introduce your child to the public library. 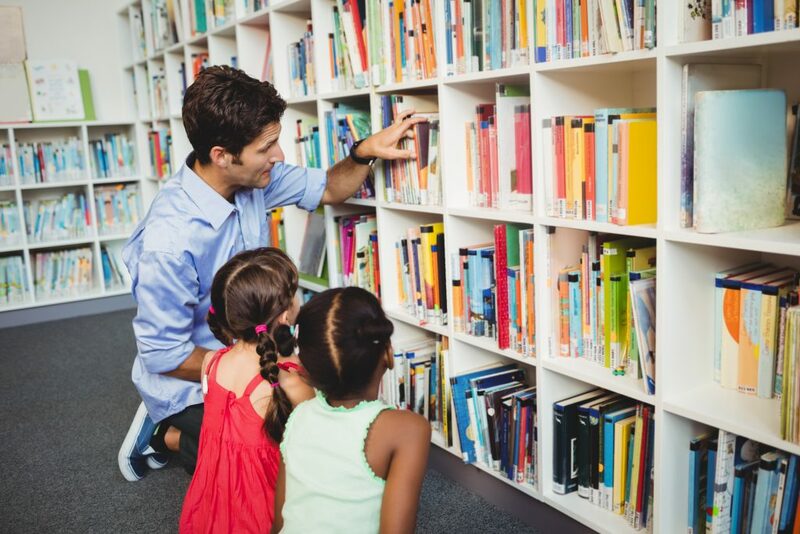 If your child is unfamiliar with libraries, their first visit can be overwhelming. If you think about it, there are many unspoken rules about library behavior. By preparing your child for these expectations, you help them feel more at home in a new place. For instance, you may want to explain why the books on the shelves are there and why it is important that they not be removed unless they’re being read. A shelf full of unfamiliar books can be very tempting to a small child who would love nothing more than to collect them just for fun. Also, while libraries are much more child-friendly than the stereotype may imply, it is good to prepare your child to speak in an inside voice and only walk inside the building. If you are looking for a quiet, calm first visit to the public library, you may want to choose a time that works best for you and just spend time exploring. However, if you are looking to socialize and take advantage of educational programming, be sure to check the library’s webpage or call ahead to learn the times of special play hours, family events, and storytimes. The Frisco public library has limited space available for children’s events, so it may be best to come early and enjoy exploring before getting a ticket and heading upstairs. For children ages 5 and under, the Ready to Read Railroad is the Frisco public library’s play area that adds a fun, active element to your visit as well. If you hope to take books or videos home with you on your first visit but you are not yet a member, be sure to bring the materials you need to get a library card. At Frisco’s public library, you must have a photo ID and proof of address to become a member. A Texas driver’s license will serve both purposes. If your license does not have your current address, you will need to bring other proof, such as a current bill or lease agreement. Alternatively, you can apply for membership online in advance and pick up your card within seven days. If you live in Plano, Allen, McKinney, or The Colony, your cities have reciprocal agreements with the Frisco library and you can apply for a card online. If you are planning to check out books with your child, it is worthwhile to discuss with them which types of books they would like to bring home. If your child has a favorite author or subject, explain to him or her that you will look for those books. Once you are in the library, the sheer number of available books can make choosing a few to borrow can feel very overwhelming. Alternatively, your child may be so wrapped up in playing and enjoying the library, he may not want to stop and choose books! If you discuss your plan in advance, you can be sure to grab a few books for home without struggling to choose at the moment. The public library is a resource your child will use well into adulthood. Introducing him or her now to these amazing resources and available tools is a great gift. And don’t forget, the library has far more than books available! The Frisco public library includes a digital library, language learning software, research databases, and numerous other fascinating resources. Ask a librarian to learn more. Are you looking for childcare that will encourage your child to love learning? Consider Legacy Academy Frisco. Call or visit today to learn more.